Many advisors still recommend holding for the long term and suggest that investors “ride out the storm.” This may eventually work for very young investors but may prove to be a poor strategy for everyone else. Bull and bear markets tend to move in cycles lasting for about 20 years. The Dow's 1929 peak was not surpassed until 1953 (24 years later), the Dow's 1968 peak was not surpassed until 1982 (14 years later) and the Japanese NIKKEI is down 80% from its peak of 44,000 in 1989. As of this writing, the Dow is at the same level that it was at the beginning of 1999 and the storm has only just begun. When inflation is taken into account, the length of time to break even becomes significantly longer. The current crisis is about to send inflation soaring, wreaking havoc on even the most conservative investor's portfolio. As defaults and foreclosures intensify and house prices continue to decline, the recession will get worse and the credit crisis will be amplified by the $1.2 quadrillion of derivatives that have been created. This will require increasingly larger government rescue and bailout attempts. What's worse, this influx of money is certain to have unintended consequences that are both long-term and very damaging. Although trillions of dollars in bailouts have already been issued, they will take time to work through the system, and lawmakers and economists admit there is no guarantee that they will work. Currently, we are in the midst of a liquidity crisis brought on by the bursting of two asset bubbles. But the real danger is that the liquidity issue could become a full-blown insolvency crisis if credit is not made available in time to re-liquefy the system. Over the past few months the US Fed and most other central banks have been increasing money supply by ever-higher amounts in order to fund the various bailouts. 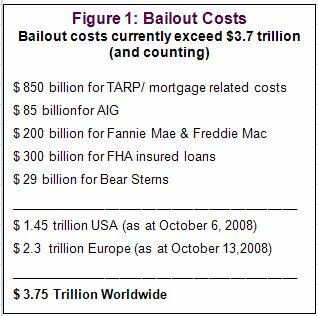 TARP, the most recent US bailout at the time this article was written, will cost taxpayers $850 billion. When all of this year's bailouts are taken into account, they already total $1.45 trillion (see Figure 1) and some pundits are estimating that the total may eventually reach $5 trillion. In addition, on October 13 Europe created a $2.3 trillion bailout package to protect the continent's banks. As a result of this crisis, the Fed, as well as other central banks, are about to enter a new phase in the easing of monetary policy that has already taken real interest rates below zero when the real inflation rate is taken into account. Most economists agree that inflation arises when the central banks increase the money supply in excess of the rate of GDP growth. For many years, the world's central banks have been doing just that. The fact is, global expansion in money supply has been depreciating all currencies, not just US dollars. The law of supply and demand is inescapable. If too many dollars chase too few goods, those goods must rise in price. Inflation always decreases real wealth by eroding purchasing power. In the US, the Fed and Treasury are already pumping out vast amounts of public money to “liquefy” the banking system, and US money growth is now running at close to 14%, well above the official GDP rate of 3-4%. This year alone the total money supply, as measured by M3, has already increased by over $1 trillion. This doesn't include the announced bailouts. Another $1.6 trillion was potentially added to the government's exposure when the Fed recently announced they would begin buying secured and unsecured commercial paper (short-term loans for business). This is a historic first; it did not occur even in the midst of the Great Depression. Then there is the interest expense the government must pay on all that borrowed money. Estimates are approximately $64 billion per year, but that is rising. Where is the money going to come from? Not from higher taxes, as consumers have already been hurt by rapidly declining home and stock prices. The US government will have to issue more treasuries and bonds and, if they are not to sold to investors, then the Fed will simply monetize the debt by “printing” more money. Apart from the current bailouts, the US also has to print money on an accelerating basis for its unfunded Social Security and Medicare obligations, which at present are about $60 trillion. Numbers of this size are hard to relate to, but it works out to about $200,000 for every man, woman and child in the US. After a big run-up, commodity prices have pulled back as recession fears begin to spread. While no one can call the bottom or knows if we are heading for a mild or a deep recession, the consensus is for a global slowdown with rising unemployment. Longer term, inflationary pressures will start to rise as the newly printed money works its way into the system. In addition, due to the decline in global oil production coupled with rising demand from China, India, Russia and Brazil, oil prices will resume their surge. As oil is used in the manufacturing of most products as well as agriculture, mining and transportation, rising oil prices will lead to increases in most commodities and finished products. Meanwhile, all the money that was printed and borrowed to try and liquefy the system will escalate prices, leading to an inflationary recession. The worst of all possible worlds is declining purchasing power combined with high unemployment and rising prices. This is 1970s-style stagflation, but because inflation numbers have been understated for years, and money supply is set to increase at unprecedented rates, this time it could intensify into a hyperinflationary depression. Since 1971, central banks have had the ability to create money without any limits, and they are using it to their advantage. Apart from the US M3 money supply, which is growing at about 16%, India is at 20%, China is at 16%, Russia is at 31% and Brazil is at 32%. The US Fed and government will do whatever it takes to bail out the banking system and avoid a deflationary depression. 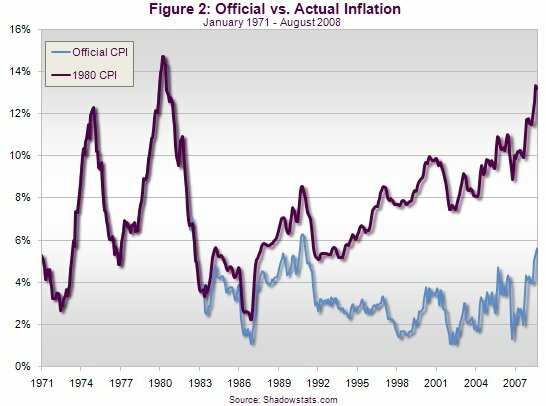 A 1970s-style inflation is preferable to a 1930s-style deflation. However, due to the extreme levels of debt, derivatives and other exotic financial instruments this strategy could lead to a hyperinflationary depression like the one currently being experienced in Zimbabwe. Yet the US, and for that matter any government, has a strong incentive to expand money supply as a stealth tax to inflate its way out of its debt problems. Official US inflation as measured by the Consumer Price Index (CPI) is currently running at about 5% (3% in Canada). But is this real inflation? The calculations governments now use for CPI are really meaningless as a true inflation indicator. Since 1980, the methodology used to calculate the CPI has changed. Using the original formula of a fixed basket of goods and services, economist John Williams has recreated the CPI as you can see in Figure 2. The SGS Alternate CPI uses the original 1980 formula and results in a CPI of 13%. When a country's money supply is increased, its currency is debased. As the currency's purchasing power declines, prices appear to be rising. And with global money supply growing at double digit rates, rising prices and real inflation is likely to be closer to 14% rather than the official 5%. Taking into account real inflation together with increasing money supply, many fixed income investors and retirees will come to realize that instead of being “safe” investments, they are in fact guaranteed losses of purchasing power. At a bond yield of 4% and inflation of 13%, investors are losing 9% in purchasing power before taxes. At the same time, the principal is declining at 13%. Over a 10-year period, $100,000 becomes only $28,555 even if there is no default. In times of crisis and extraordinary financial stress, astute investors take refuge in precious metals. Their unique characteristics mean they are neither anyone's liability (bonds) nor someone's promise of performance (stocks). As central banks worldwide continue to accelerate the pace at which money is printed, inflation will increase while bonds, stocks and confidence in printed currencies will decline. Precious metals have been a proven store of value for over 3,000 years. In today's environment, portfolios need to be structured to counteract the effects of inflation. With bond yields being below the real inflation rate, it becomes difficult for investors requiring current cash flow to find suitable investments. An alternative to fixed income investments is placing a portion of assets into investments that appreciate at a higher rate than prevailing inflation. By liquidating some capital gains, investors will be able to maintain their income and preserve capital instead of experiencing a loss of both purchasing power and principal in fixed income investments. Over the long term, precious metals have generally outperformed inflation. A calculator comparing fixed income investments to liquidating a portion of the capital gains is available at www.bmginc.ca/bondsvsbullion . Investors can simply insert their own assumptions and see the results after tax and after inflation. Inflation is coming. In an environment of soaring inflation, precious metals are poised to soar alongside.